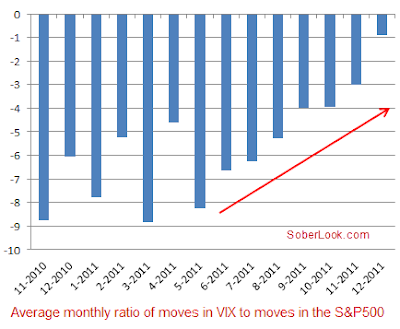 Sober Look: Index option hedges have not been effective: poor "option responsiveness"
Index option hedges have not been effective: poor "option responsiveness"
As one trader said - "the freakin option hedges are just killing me!" The frustration in the market place has been that being long index options to hedge portfolios hasn't produced the results people were looking for. Typically as stocks sell off, implied volatility jumps. In the recent years for the S&P500 the relationship has on average been roughly -5.5 to 1. That is for a 1% move in the S&P500, the implied volatility should move 5.5% (of vol - not vol points) in the opposite direction (again, on average). The chart below shows the daily regression between the two. What market participants who use index options to hedge have been looking for is sometimes called "option responsiveness". If you are long some SPY puts and the market drops, you would expect not only to get a kick from the underlying decreasing, but also from the implied volatility jumping based on the above ratio. But that strategy hasn't been very successful lately. In fact VIX (implied volatility index) to S&P move ratio has been on the decline. The chart below takes the monthly average of the ratio, using only the days when the S&P moves have been over 25bp (up or down). There are numerous explanations for this recent trend, none of them very satisfactory. The most popular one has been that portfolio managers had overloaded on put protection during the "dark days" of the crisis and with put positions "decaying" against them, used any market sell-off as an opportunity to lighten up. That means that the ratio may hold when the market is up, but be below expectations when the market drops - working against those who are long puts. This dampened the implied volatility increases during sell-offs, reducing "responsiveness". Given the premiums people had to for the puts with recent elevated levels of implied volatility, it's no wonder portfolio managers are frustrated. One trader called it "option fatigue". 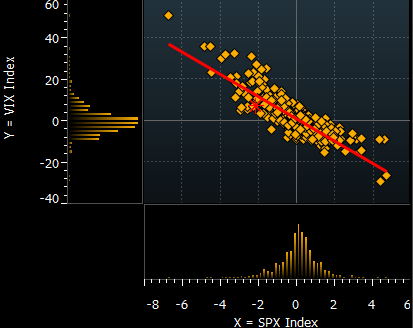 Fundamentally, the 60-day historical volatility in the S&P500 is about 29% and VIX is roughly at that level as well. Some may argue that implied vol should trade at a slight premium to historical, but the market is obviously pricing in some reduction in volatility going into the holidays.